The Prep girls footballers were back in action for the first time since Valencia. The weather was a million miles away from the Spanish sunshine, as we headed for St Bedes, Manchester to play in a three way tournament with the hosts and Bury Grammar. For many, it was to be their first experience of playing in an actual game and hopefully the freezing cold and rain has not put them off. I promise you girls, it will be much warmer in Valencia in October when we return! The A team and B team both kicked off with games against Bury Grammar A and B. The B team were involved in an end to end game with the ball flying around the pitch in all directions. Evie, Jess and Holly were busy in midfield, Jasmine foraged about in attack, whilst Freya and Juliette denied opposition attacks in defence. When the defence was breached, Emily proved to be a more than capable goalkeeper. With time running out, Jess found herself free in front of goal and fired home coolly to give the excited girls a well earned 1-0 win. The A team found the going a bit tougher against Bury Grammar A team. Two early goals were enough to win the game for Bury, whilst Bridgewater struggled to settle into playing as a team for the first time. In the second half, Ellen twice went close to getting the team back into the game. Esme battled away up front, Allegra and Nyla were energetic in midfield, whilst Molly and Dina looked increasingly in control at the back as the game wore on. In game three, the A team played the first half, with the B team taking over in the second half against Bury Grammar B. This combination proved far too strong for the opposition and Bridgewater dominated possession in both halves of the game. A first half hat trick from Ellen gave the team a comfortable 3-0 half time lead. Jess, Evie, Holly and Juliette all went close to adding to the lead in the second half, before Jasmine and Freya put the game to bed late on to seal a 5-0 win. The final game of the afternoon was against the hosts St Bedes. Molly and Dina were busy at the back as the hosts pressed for a win, whilst Emma made some important saves in the Bridgewater goal. Ellen again went the closest to scoring for Bridgewater, but with the snow starting to fall, the game was cut short to give both teams a point and a chance to get warm and a biscuit! 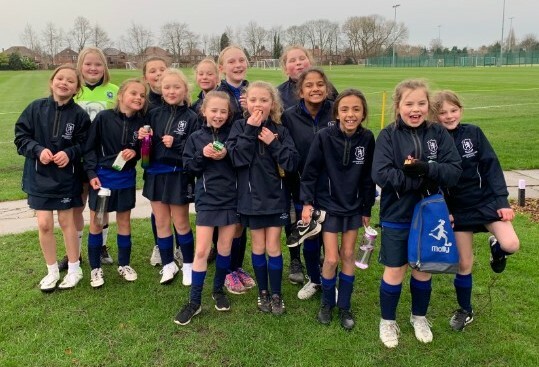 Well done girls, good to see you all playing and enjoying football once again and we look forward to returning to St Bedes in a few weeks for the AJIS 7-a-side tournament. I really enjoyed this because there was some new girls on the team and they tried their best. It was a good mach !!!!! !